Mother’s Day was first celebrated back in 1908, and ever since we all look forward celebrating this day for our moms! On that day, treat your mom like a queen, after all, she’s the Queen of the Day. Make sure she stays away from the kitchen. For at least a day or two each year (the more the better), pamper her and show her some TLC (Tender Loving Care) by not letting her wet her hands doing kitchen chores or anything tiresome. Let her dress up for the day ready to meet the entire family for lunch, dinner or merienda get-together in celebration of Mother’s Day. It’s going to be one ‘heaven’ of a reunion, where each family member gifts the light of the home with flowers, cake and, of course, the favorite family pizza Filipino homes have known for generations—3M. For sure, 3M Pizza rings a bell to you and to your parents, uncles and aunties, and even lolos and lolas. This pizza brand has been around a long, long time—as far back as 1969, in fact. So 3M Pizza and almost every Pinoy home must really have come a long way inseparably observing traditional and modern celebrations. Mother’s Day is one really good occasion to partake of 3M pizza because it’s the day you’ve all got to keep Mom away from cooking. It’s sufficiently gratifying to share 3M pizza with the rest of the family on this day. 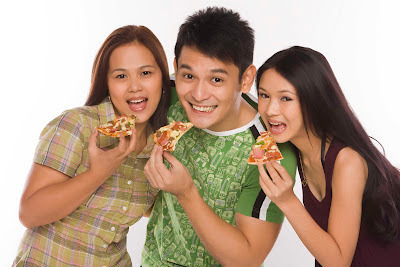 The new 3M pizza flavors further boost this pizza’s Pinoy image. We’ve now been been given truly Filipino flavors for us to broaden our choices. According to the top honcho behind 3M, Noel Sun, the company plans to expand their pasta and snacks line to supplement their spaghetti, lasagna and pizzadog. All are truly Pinoy na Pinoy to the palate! Surprise Mom, too, of 3M’s now beefed-up yummy offerings that include an assortment of pastas, salads and complete meal packages. One inspired Filipino dish that will surely bet your queen’s liking is the spicy Bicol Express pizza, which proved to be a big hit. The pasta line will also be expanded to include new variants that are uniquely Filipino. What about parading before her mouth-watering lasagna and crunchy fried chicken? Or stack up the meal table with an assortment of salads instead—for health! Mom will be surprised to learn that 3M is now not just a pizza parlor but one that serves an assortment of yummy treats for meals or snacks. There’s a wide array of sumptuous food to choose from. Drop by at 3M closest to home and in a jiffy, drive home with pizzas, pastas, salads, fried chickens, etc. etc. etc.–enough to feed the whole family. “Currently, 3M, which has been around since 1969, has 44 outlets of which four are company outlets, the rest, dealers,” Sun said. Mother’s Day is Family Bonding time with 3M Pizza. But if your queen seems bored staying home most of the time, then sweep her off her feet and drive around town with her, showing the latest gig places, and when she’s hungry, take her to the surprise of her life by treating her to 3M pizza. She’d really get the surprise of her life to see how 3M has ‘changed’ image to keep up with the times and how its menu today is a far cry from yesterday’s. Watch Mom’s face as she’d likely exclaim: “Transformed!” Uh-huh, 3M pizza has indeed transformed but the elements that came with the 3M pizza that Mom and Lola used to know are still very much around—and surely, Mom can discern those. Wanna bet?